Neri Oxman will be presenting at the Critical Digital conference at the GSD (Graduate School of Design at Harvard University) this weekend under this title and with much more ideology than meets the eye. Additional information form the website: The purpose of Critical Digital is to foster a dialog about digital media, digital technology, and design and to challenge the basis of contemporary digital media arguments. The intention is to identify, distinguish, and offer a critique on current trends, tendencies, movements, and practices in digital culture. Critical Digital provides a forum for discussion and enrichment of the experiences in this discourse. Through diverse activities, symposia, competitions, conferences, and publications, Critical Digital is supporting dialogue that challenges what is rapidly becoming the de facto mainstream. What is digital? Why should design be (or not) digital? How have practitioners and schools been using digital media? The theme of the first conference is What Matter(s)? As the current theoretical discourse in architecture seems to elude digital phenomena, a crucial critical discussion is emerging as a means to address, understand, clarify, and assess the elusive nature of this discourse. Issues related to virtuality, ephemerality, continuity, materiality, or ubiquity, to name a few, while originally invented to explain digital or computational phenomena, are utilized today in the context of a traditionally still material-based design. What is the nature of their use? Is materiality subject to abstract digital concepts? Is the digital buildable? What matters? As we progress to think and design for the built environment, interactive space, and the body what materializations are actually emerging? What physical manifestations and manifestos are to be promoted? Critical Digital presents and calls for your participation in What Matter(s). Intentionally, the provocation is for both critical writings and projective works which address the issue of the digital within the contemporary design discourse. 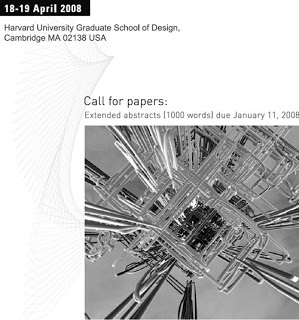 What matter(s) in terms of work, process, and thought is to be curated and published and to be debated in an open format at the Graduate School of Design of Harvard University on April 18 and 19 of 2008.